The ADIAS Occasional Newsletter is edited by Peter Hellyer & Dr. Mark Beech. Also available for download: Microsoft Word format (click here - 143 Kb) or Acrobat pdf file (click here 247 Kb). A focus on fossils and on flints from the Late Stone Age has marked the initial weeks of the 2002-2003 ADIAS winter season - so much so, in fact, that this first issue of the ADIAS Occasional Newsletter for the season has been somewhat delayed! Our apologies to our readers. The fossil site is near Ruwais, and was first identified earlier in the year by an ADIAS team that was undertaking an impact assessment for TAKREER, the oil-refining arm of the ADNOC Group. Following the initial discovery, further work was undertaken in June and early October, indicating that the site has a multitude of important vertebrate fossil remains from the Late Miocene period, around 6 to 8 million years ago. Of the same date as sites already discovered in the early 1990s near Jebel Dhanna, the new Ruwais site has produced major discoveries, including fossil remains of elephants, hippopotami, horses, crocodiles and turtles. A 2.54 metre fossil elephant tusk is probably the most important of the finds. The Late Stone Age focus on flint involves further work at a site at Abu Dhabi International Airport, first discovered and investigated by ADIAS in 1995. Over the years, natural erosion and the impact of occasional rainfall has brought more finds to the surface, including some important discoveries, while the evidence of Late Stone Age occupation at the Airport has now been shown to extend over a wider area than was originally recognised. The further work is designed to recover more information about what is now clearly recognised as one of the most important sites of its period anywhere in the Emirates. Further information on each of these two projects can be found elsewhere in this issue of the Occasional Newsletter, while press releases are being issued to the UAE local media on the work. Planning for, and commencing this work has, naturally, occupied quite a lot of time over the course of the past few weeks. Fortunately, ADIAS has expanded its capacity to cope through the recruitment of two new resident members of staff, Dr. Mark Beech, formerly of the University of York, in Britain, and Mrs. Ingrid Barcelo, to complement the efforts of other team members. Mark has been coming to the UAE for nine years to participate in ADIAS fieldwork, (see separate story), while Ingrid is an environmentalist also working with the Terrestrial Environment Research Centre of the Environmental Research and Wildlife Development Agency, ERWDA, further consolidating the ADIAS-ERWDA link. Besides a number of other fieldwork projects provisionally scheduled for February and March, the ADIAS team will be focussing over the course of the next few months on completing reports on earlier work for eventual publication and on continuing to develop collaboration with the Environmental Research and Wildlife Development Agency, ERWDA. 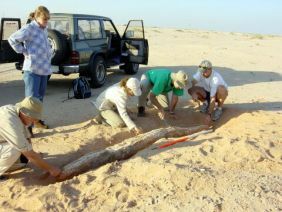 ADIAS survey work for fossils in the Ruwais area of the Western Region has succeeded in finding the largest fossil elephant tusk ever found in the Middle East area. The work is being carried out with support from the Abu Dhabi Oil Refining Company (TAKREER), the oil refinery arm of the Abu Dhabi National Oil Company, ADNOC, Group. The tusk, which is a total of 2.54 metres in length, was discovered in late October in a location that is to be developed by TAKREER as the location for its new Central Environment Protection Facilities Project (BeAAT) in Ruwais. The purpose of the survey work being undertaken by ADIAS is to identify all the key spots within the area scheduled for development, and to recover the fossils. By mid-December, a total of around 5,000 individual fossil fragments had been collected during our work, many of them sufficiently large and well-preserved to permit identifications to be made of the animals from which they came. Further work is planned for early February 2003. The fossil elephant tusk, the most important of the finds, is of probable Late Miocene date, from a period around six to eight million years ago when the Western Region an area of well-wooded savannah plains and slow-moving rivers, rather like the East Africa of today. Other Late Miocene fossils have been found elsewhere in the Western Region by researchers from London's Natural History Museum and Yale University, but the tusk is the largest single fossil of this type and date ever found over an area that stretches from Pakistan in the east to North Africa in the west. "We are stunned by this discovery," says Dr. Mark Beech, our Senior Resident Archaeologist, who was the fortunate individual to locate the find. "Only a very small part of the tusk, a few centimetres long, was initially visible on the surface, though we suspected that it might be an important find." In mid-November, with support from volunteers from the Emirates Natural History Group and the Terrestrial Environment Research Centre of the Environmental Research and Wildlife Development Agency, ERWDA, the ADIAS team returned to the site to excavate the find. "Once we had excavated the tusk, it was obvious that we needed to use some very special techniques to lift it and get it back to Abu Dhabi," says Dr. Beech, who has also discovered Miocene fossils in Kuwait and Pakistan. "It was very fragile and needed careful conservation on the site. We estimated that the tusk, along with a special case to protect it, would weigh up to 400 kilograms." In early December, with the support of TAKREER, who provided special logistics equipment, including a lorry and a crane, Dr. Beech, ADIAS colleagues and a scientist specially flown out from Britain's University of York, Will Higgs, returned to the site. The tusk was first carefully treated with chemicals to prevent it crumbling, then special foam was used around the tusk to protect it, before it could be lifted onto a truck for transporting back to Abu Dhabi. The tusk is now awaiting further conservation treatment, following which it will be placed on display by ADIAS and ERWDA. "We are delighted that our sponsorship of this ADIAS work has yielded such magnificent results, "a TAKREER Official told the local press. "Once we had settled on this area for our new Central Environment Protection Facilities Project (BeAAT), we promptly commissioned an initial survey by ADIAS in April 2002 to check for the presence of archaeological and fossil sites, as part of our continuing policy to protect the UAE's environment and heritage. Once ADIAS informed us of the presence of important fossils in the area, we decided to support further studies. This discovery represents an important addition to our knowledge of the UAE's heritage, and TAKREER is proud to have played a part in the process." TAKREER have been enormously supportive of ADIAS work in the area and have provided substantial financial support to permit the survey and excavation work to take place. The area of the fossil finds has been assigned to TAKREER for its long-term development plans, but much of the area will not, in fact, be needed. ADIAS, ERWDA and TAKREER are, therefore, now working out a procedure whereby as much as possible of the area can be provided with long term protection, an example of the way in which the local oil industry and environmental and archaeological bodies can collaborate to preserve the country's heritage. Dr. Heiko Kallweit gives a tour of the Abu Dhabi International Airport archaeological site to Marjorie Estevill and her students from Zayed University. A short season of fieldwork at the Abu Dhabi International Airport archaeological site concluded just before the end of December, producing new information about use of the site during the Late Stone Age or Arabian Neolithic period, between 8,000 and 5,000 years ago. The site lies within the boundary of the Al Ghazal Golf Club, which is managed by Abu Dhabi Duty Free, and the ADIAS work at the site was supported by Duty Free and by the Abu Dhabi Department of Civil Aviation. According to the ADIAS Field Director, Dr. Heiko Kallweit, of Germany's University of Freiburg, several hundred archaeological finds, including both several hundred fragments of worked flint (stone) and a smaller number of fragments of pottery, were collected during the two weeks of fieldwork on the site. The pottery dates primarily to the early part of the local Bronze Age, while the flint material dates to the Late Stone Age or Arabian Neolithic period, which preceded the Bronze Age. "Our first season of fieldwork on the site, in the summer of 1996, had already shown its importance," says Kallweit. "We knew that it had been occupied at four periods, the Late Stone Age or Arabian Neolithic, then two periods in the Bronze Age, the Hafit period, around 3,000 BC, and the Umm al-Nar period, from around 2,500 BC to 2,000 BC, and finally around 2,000 years ago." "Our latest fieldwork has produced two important results. First, a detailed study of the whole of the Al Ghazal Golf Course has shown that occupation in the Late Stone Age covered a much larger area than had previously been recognised. In terms of size, the Abu Dhabi Airport site is one of the largest Late Stone Ages sites in the country," Kallweit said. "The second major discovery was a number of very small stone tools, known as 'microliths', probably used to form the blades of early sickles, used for cutting wild grasses, or, possibly, crops. Such microliths have never previously been published from the Emirates, and are known elsewhere in the peninsula only from western Saudi Arabia, near the Red Sea coast," Kallweit added. The Saudi Arabian microliths have been dated to the early Fourth Millennium BC, or between around 3500 - 4000 BC, a period about which very little is known in the Emirates. "These finds may help us to begin to understand this period in UAE history," Kallweit said. Besides support from the Al Ghazal Golf Club, Duty Free and the Department of Civil Aviation, ADIAS also received help from a number of other organisations. Local contracting firm Hilalco lent equipment and surveyors to prepare a detailed map of the site, permitting the precise location of each find to be recorded. Other help was provided by a group of volunteers from the Emirates Natural History Group, who worked on the site daily. Special thanks go these volunteers for their help. The team included Joan Andersen, Willem and Artur Arntz, Chris Bettney, Martin and Linda Betz, Mary Cochrun, Karen Cooper, Marc Dyer, Drew Gardner, Alan and Robert McGee. The Emirates Natural History Group also made a donation towards the cost of the work (see separate story). Other members of the ADIAS team included local staff members Dr. Mark Beech and Ingrid Barcelo, and Sarah Wood, from Britain's University of East Anglia. While the help provided by the volunteers was of great value in permitting the work to be undertaken, ADIAS also benefited substantially from assistance given by a number of companies and institutions. In particular, help from the Golf Club and from Abu Dhabi Duty Free was invaluable while, as for the first season of ADIAS work at the site, backing was also provided by the Department of Civil Aviation, whose Chairman, Sheikh Hamdan bin Mubarak Al Nahyan, has long been a supporter of ADIAS. At a technical level, the mapping done by Hilalco was of enormous help, and the company's management and staff are thanked for their contribution to the research programme. As a result of the work, two areas on the outer limits of the site will now be handed back to the Golf Club, with the central area of the site continuing to be protected. A further season of fieldwork is now being planned for winter 2003/2004. The development of archaeology in the UAE can only be effective in the long run if UAE nationals are involved, both in terms of general knowledge and interest and in terms of being trained to work as archaeologists. Over the last few months, ADIAS has succeeded in making some significant steps forward in terms of involving UAE nationals in its activities. A new venture by ADIAS in terms of spreading knowledge about archaeology amongst UAE citizens has been the launching of a special lecture programme at the Abu Dhabi campus of Zayed University, organised by ZU staff member Marjorie Estevill. A first lecture, providing an overview of UAE archaeology, was given in early November by ADIAS Executive Director Peter Hellyer, followed by another in mid-December by our Senior Resident Archaeologist, Dr. Mark Beech, who explained the purpose and practice of archaeology to the ZU students. Further lectures will be given in the New Year. The ZU programme has also involved a field visit to the Abu Dhabi Airport site, attended by a number of students, while a demonstration of techniques of flint knapping is to be given at the University in early January by ADIAS lithics expert Dr. Heiko Kallweit. A lengthy summary of the archaeology of the island of Abu al-Abyadh, including a gazetteer of all the sites so far discovered on the island has now been published. The report, written by Peter Hellyer and Daniel Hull, is one of the chapters in a new book published by the Environmental Research and Wildlife Development Agency, ERWDA, and edited by Dr. Richard Perry. Copies of the book, entitled simply The Island of Abu al Abyad,' can be obtained on application to ERWDA. During ADIAS fieldwork on the island and subsequent analysis of pottery and flint material, as well as radiocarbon (C14) dating of charcoal and ash from several old fireplaces, we have been able to build up a picture of occupation that dates back to the Late Stone Age (Arabian Neolithic) period, around 7,500 to 5,500 years ago, although most occupation seems to have occurred during the Late Islamic period, covering the last four or five hundred years. Abu al-Abyadh is now to be included in the Marawah Marine Protected Area, MPA, formally established early in 2002. Within the MPA, there are also several other islands with important archaeological sites, including Marawah and Liffiyah, while the protected area also covers an important stretch of coastline. As part of planning for the long-term management of the MPA, ADIAS will be collaborating with its manager, ERWDA, while we hope to carry out further investigations on the islands throughout the MPA, to help us gain as full a picture as possible of the archaeological and fossil material. Dr. Mark Beech, an Honorary Research Fellow in the Department of Archaeology at the University of York, took up an appointment as the ADIAS Senior Resident Archaeologist in late October 2002. Mark completed his Bachelor of Sciences degree in Archaeology at the Institute of Archaeology, University College London (1982-85). After working for the Ancient Monuments Zooarchaeology Laboratory at English Heritage and the Passmore Edwards Museum in London, he then completed his Master degree in Environmental Archaeology and Palaeoeconomy in the Department of Archaeology and Prehistory at the University of Sheffield (1986-87). Subsequently, he worked as an archaeological consultant on a number of international projects in Bulgaria, France, Jordan and Pakistan. From 1991-95 he was employed as a Researcher in the Environmental Department at the Institute of Archaeology, Czech Academy of Sciences, Prague, in the Czech Republic. From 1995-96, he was employed in the English Heritage Zooarchaeology Laboratory, Department of Ancient History and Archaeology, University of Birmingham, U.K. In 1996 he worked as a Natural Environment Research Council (NERC) Research Assistant to Dr. Keith Dobney in the Environmental Archaeology Unit (EAU) at the University of York, U.K. This involved analysing animal bones from a 10,000 year old site located in northern Iraq. His doctoral research was conducted in the Departments of Archaeology and Biology at the University of York (1997-2001). The title of his PhD thesis was "In the Land of the Ichthyophagi: Modelling fish exploitation in the Arabian Gulf and Gulf of Oman from the 5th millennium BC to the Late Islamic Period". This research examined fish bones from 23 archaeological sites in the Arabian Gulf, ranging from Kuwait to Saudi Arabia to the U.A.E. Mark plans to publish his PhD thesis in 2003 in the well known "British Archaeological Reports - International Publication Series". This will be the first in a new series of ADIAS archaeological monographs. Mark has been an annual member of the ADIAS team since 1994. As well as his detailed study of fish bones and other environmental data from all of the ADIAS sites he has been directly involved in much of the fieldwork carried out by ADIAS over the course of the past nine years. 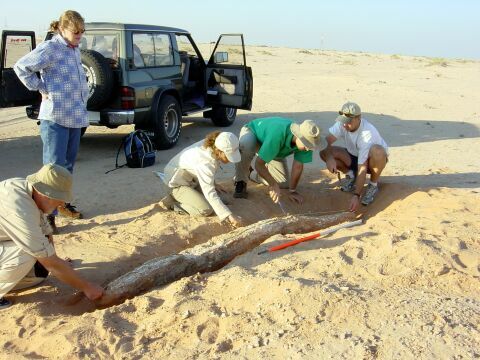 This has included participation in the excavations at the Nestorian church and monastery on Sir Bani Yas Island (1994-6), survey and excavations of Iron age hearths and Late Islamic middens on Balghelam Island (1997), excavations on Marawah of the early Islamic lime kilns (1999), and excavations at the 7000 year old Arabian Neolithic village on Dalma Island (1998 and 2001). More recently he has been involved in archaeological work at the Abu Dhabi Airport Al Ghazal Golf Club site, as well as being concerned with the investigation of the Late Miocene fossil site near Ruwais (see separate stories). The Abu Dhabi-based Emirates Natural History Group has provided a grant to ADIAS from its Conservation Fund, to help with the costs of the Abu Dhabi Airport excavations. The Group, the oldest environmentally-focussed non-governmental organisation in the UAE, was established in 1977. In recent years, using funds raised by its members and supplied by its Corporate sponsors, the ENHG has provided a number of small grants for environmental and archaeological projects. Other archaeological teams to have benefited in recent years include Sydney University teams working at Muwailah, in Sharjah, and Bidiya, in Fujairah. In return for the support, Airport site Field Director Dr. Heiko Kallweit and ADIAS Executive Director Peter Hellyer gave a talk on the site to the Group's mid-December meeting, while a summary of results from the work will be published in a forthcoming issue of the Group's bi-annual journal, Tribulus.